A woman who drinks 30 cans a day says her addiction to energy drinks is worse than gambling. Emma Forrest consumes 3,000 calories a day - that is 200 teaspoons of sugar - and says she would rather lose her relationship with her twin sister than give up the drinks. The 29-year-old wakes up five times a night to satisfy her cravings and eats just one meal a day to keep her weight to nine stone. She now wants help for her addiction. The former gambling addict spends £250 a week on both energy and regular fizzy drinks. She told the BBC's Kaye Adams programme: "It started about three and a half years ago. "I used to have three cans, then six cans, then more and more. I remember getting to 20 cans a day. And now, if I don't have them, I end up with migraines. "I have never got a can out of my hand. I am sitting right now with two cans - one fizzy and one energy drink. "I keep a stock of 2,000 cans at home and keep 48 cans at my sister's house at all times." Emma, from Selkirk in the Borders, even has a tried-and-tested plan for when she goes on holiday. "There are five of us and we go to Turkey. I take a case and I fill everyone else's cases with Irn Bru." Emma says she feels addicted to them and feels she needs the drinks to function on a day-to-day basis. She said: "It makes me feel normal to drink them. I can't stop. "If I don't drink them, I get migraines and the shakes. So drinking them makes me feel normal like everyone else does all day, every day. "At work I am not allowed to drink it but I have been known to sneak them down to the checkout." 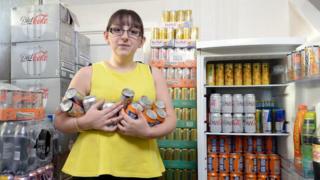 Emma works for Tesco, and surprisingly supports a ban on supermarkets selling energy drinks to children under 16. She would not like to see young people getting to the stage she has reached. "I hate seeing kids drinking them," she said. "They are so addictive. If they drink it at the age of ten, by the time they are 16 they'll be addicted. It only took me three years to get to this stage." Emma admits her addiction is making her miserable: "I'm not happy. I've had loads of grief about this as if it's something that I want to do. "I don't just drink these drinks for something to do. I have built up a tolerance to this. I couldn't get up and start drinking 20 cans of juice a day." The former gambling addict has been warned about the health dangers of consuming so much sugar and caffeine. But surprisingly, she has been given a clean bill of health from her dentist and has not gained excess weight from the 3,000 calories a day she is drinking. She has maintained her nine-stone weight, but not in the most sensible fashion. She said: "I only have one meal a day. I don't eat breakfast and I eat at about 15:00 and that's me - yesterday I ate one baguette and that was it. "But I don't ever feel hungry." Emma wants to kick her habit. She stopped her gambling addiction by banning herself from local betting shops. But she fears she will find it impossible to avoid shops which sell these drinks. "I would strongly say, having been addicted before, that I am definitely addicted. "I don't think it's a choice, I NEED to have it. "I was addicted to gambling and now this has replaced it." Emma is waiting to see an addiction psychologist and hopes this will give her the strength to kick the habit for good. "There was very little I heard from Emma apart from deep unhappiness - she is not getting anything positive from her addiction, but a sense of fear she wouldn't cope if she stopped doing it. "It sounds like an addictive personality but it doesn't mean she has no hope at all. There are still decisions to make and she can still control it. "Emma needs to build up a feeling of control. It would be great for her to to talk to a medical expert and find out her the long-term prognosis of stopping these drinks. "The headaches etc will go away. She was clearly able to stop the gambling. "She needs to think she can apply the same strength of character she did to the gambling. "There is a way out of it. She has got the strength there to stop." "The levels of sugar in some energy drinks are excessively high. The consequence of that is an increase in body weight. That leads to increased risk of obesity and type 2 diabetes. "One other element is the impact on dental health. There is nothing in human diet that has as much impact as sugar on your teeth. Someone who drinks this amount of fizzy drinks is bound to have tooth decay. "It's concerning because you need other nutrients from other different food groups and just by having one meal there is concern. In these drinks there are no nutrients at all, they are just empty calories that have no nutritional value. "And with the caffeine there is an element of addiction and the consequence of insomnia, lack of sleep, lack of restorative sleep. "As a result she is probably staying up and burning more calories but that is not particularly healthy."